The system uses a space-saving 5-gallon aquarium (included) utilizing a simple airlift pump. The water flows through thefilter media along to the plants. The filtered water thenreturns to the fish. This system can be used to grow a variety of herbs and lettuces. This grow rack can be used with an existing tank or aquarium or placed on top of optional 55 gallon fish/filter barrels (sold separately) It can also be used next to a pond outdoors. This simple, compact and efficient design fits any classroom. The three containers are configured like an ecosystem featuring biological filtration and an area for plant growth. The system is self contained, needs no direct plumbing connections and is priced less than you'd think. Teach the fundamentals of a fast growing agriculture opportunity with this simple, compact and efficient design. This complete aquaponics system is small enough to fit on a counter or table yet provides a lot of value. Teach the fundamentals of aquaculture or put a complete system in your home with this simple, compact and efficient system. 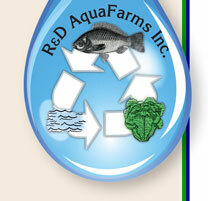 The three barrel aquaculture system is a complete aquaculture/aquaponics system that fits in a 5' square area. The three barrels are configured like an ecosystem featuring biological filtration and an area for plant growth and can support up to 15 full size tilapia. Teach the fundamentals of aquaponics with this simple, compact and efficient design. The top half barrel is used both as a filtration system and a plant growbed. The two connected barrels hold almost 100 gallons of water. Both barrels can hold fish giving you the flexibility to separate sizes or species. Not everyone has access to aquaculture food or can use 50lbs. or 200 lbs. at a time, so we've added food to our list. This is the same high quality food we feed to our fry and fingerlings, but packaged in the quantities you need. Available in 4 different sized floating or sinking pellets in one pound increments. We will also custom mix food according to the sizes of fish you have. This helps ensure that the less aggressive eaters are getting the food they need.